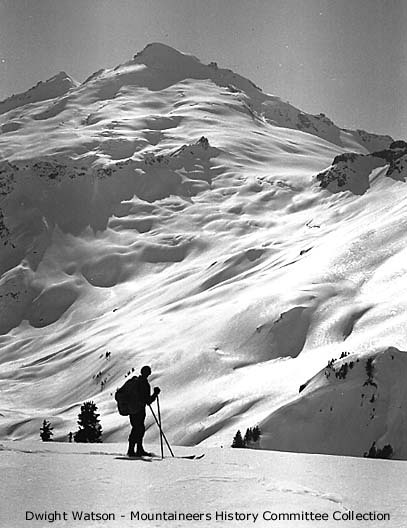 On May 12, 1939, Dwight Watson, Erick Larson and Andy Hennig traversed from Kulshan Cabin to the Mt Baker ski area over the summit of Mt Baker using skis. It was the first time anyone ever traversed over the top of Baker on foot or ski and Watson made a 16mm movie of his trip. Some of you may have seen this film in my historical presentation, "The Snowy Range." In 1990, not knowing much about Watson's trip, I skied the route in the opposite direction over two days with my brother Carl. In 1998, I repeated the traverse as a one-day trip with Bruce Goodson. Standing tiredly on the summit after twelve hours of skinning, I realized we'd chosen the wrong direction. Watson got it right the first time, going from west to east. Since I began my historical studies three years ago, I've wanted to repeat the traverse Watson's way. On Monday, June 14, John Mauro and I drove separately to Mt Baker. We parked John's car at the ski area and shuttled my car to the Kulshan trailhead. We almost aborted the trip during the drive because it was raining hard and it seemed hopeless that the weather could clear soon enough for our trip. But miracles sometimes do happen and when we left my car at 4:15 a.m. Tuesday morning, the sky was clear. We hiked to the Heliotrope moraine and skied up the Coleman Glacier, passing three parties on foot. There was considerable new snow on the peak. The trees on Bastile Ridge were flocked down to 5000 feet and in places on the glacier the fresh snow was a foot and a half deep. Climbing the Roman Wall was windy and frigid and we had trouble keeping our fingers warm. It felt like March, not June. We reached the summit at 9:45 a.m. and studied the route down the Park Glacier from above. We were tempted to ski the Park headwall, which looked straightforward, but we decided against it because of the new snow and risk of avalanche. Instead we skied down toward Sherman Crater a few hundred feet, then worked left across the upper Boulder Glacier to the Park Glacier below the headwall. On the Park Glacier we found powder. Powder in June! "Nobody's going to believe the trip report," I told John. We leapfrogged down the glacier taking pictures of each other and savoring the 4000-foot run. We stopped for lunch at the Mazama-Rainbow saddle and soaked up the warm sun, so different than the cold, windy summit we'd experienced less than an hour earlier. After lunch, we traversed to The Portals and followed the divide to the saddle west of Coleman Pinnacle. We took a boots-off rest on warm dry ground there, admiring our marvelous surroundings. Then we shouldered our packs for the last time and continued to Table Mountain, Artist Point, and finally to John's car at the ski area, arriving at 2:30 pm. Thanks to slightly sticky snow, we managed the entire route from the summit to the ski area without needing to put our skins on. We agreed that Watson's traverse is an elegant trip, a real classic. Going in the right direction, west to east, cut my previous one-day traverse time by almost a third. I think this trip is worth doing again and again. I believe it and I'm jealous. �Sounds like you were at the right place at the right time and were rewarded. �Were there any face shots? �Send me some pics will ya. Aha, those were your tracks we saw! Corey and I skied the Park Headwall yesterday. It was in unbelievable condition. After climbing it we weren't too concerned about avy danger. It seemed quite well consolidated and it wasn't warming up too much. Then we climbed the headwall again. We started to ski Boulder Glacier way, but then cut into the cliffy section of the headwall to ski a rockin' little chute above the Boulder Glacier. The traverse sounds great. I will continue to do the Boulder-Park Cleaver/Park HW again and again! Yeah, you guys' tracks were really nice looking. Somehow we missed seeing you ski down, which would have been pretty cool. A one way trip like this really sounds nice. Yesterday I could see Mt. Baker as I stepped out my door on the way to work. I figured somebody was up to something. What a gorgeous day. Today as well. Sounds like a cool trip. �Sorry I didn't get your phone message until the wee-hours. �Sounds like that rain you had on your drive was duping some freshies higher up!!! This is great beta as I am heading up with a group to ski the Park HW on Saturday morning. what a cool traverse, I'm suprised more folks haven't given it a try. looks like a few friends of mine and I might give it a go on sunday...thanks for the inspiration Lowell. Nice report, Lowell. Still hard to believe the transition from cold rain the parking lot at 1 am to starry skies upon waking at 3... and the transition from near-frostbite fingers at the summit to burning heat a few thousand feet down. Very much enjoyed it. Glad someone else took advantage of the Park headwall! And to the question of face shots (in June): absolutely. I think it's really cool to have a May 12, 1939 "trip report" on TAY. When you swung around from the Boulder glacier onto the Park did you have a fair amount of crevasse navigation/hazards to get over to the less crevassed central portion of the Park or did it go pretty easily? From photos I could find online from past years it looks like there's usually a pretty good jumble of crevasses on the upper mountain right between the park glacier and boulder glacier that one has to traverse though. any additional info would be appreciated. thanks. We didn't have much trouble getting from the Boulder to the Park. I think the higher you make the traverse, the better. (We were medium-high.) The Park was less broken up than when I did the route in reverse in 1998. There was a short section at the edge of the Park where I considered putting the rope on, but judged that it was okay without. We skied the entire descent unroped. I'm guessing this information is too late for your trip. If you went, I hope it went well. Hey Lowell, no worries about not replying sooner...I figured that with the good weather you were probably out in the mountains too. As I was looking for a good snowbridge that connected onto the Park I saw some very faint tracks (yours, I assume) and it was a welcome relief to know that we had picked the right way onto the Park glacier. We managed to shuffle along from the summit to the ski area without skins too...it was hard to believe. One of the (very few) advantages of shooting film, using mailers, and being busy is that sometimes you don't file your ski pictures until the dog days of summer. So, here's a reminder of the season just passed. That's June 15th powder John is skiing on the Park Glacier.